It is my belief that furniture should be sort of like clothes for your home. It should serve a purpose, it should reflect who you are as a person or family, and it should have an element of fun. 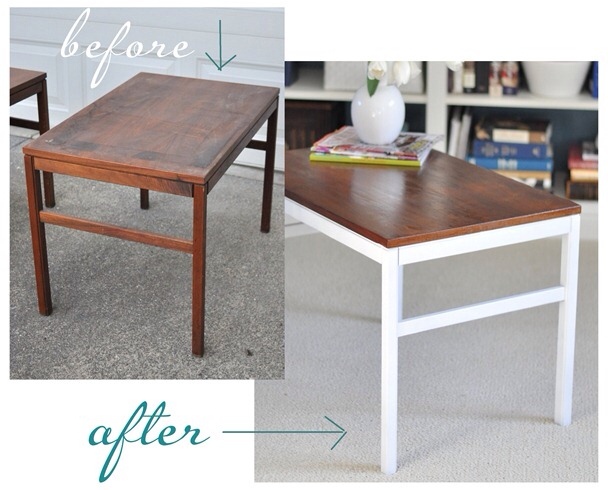 Oh, and one more thing… your furniture style can (and in my opinion, should) change, just like clothing styles. How many of you remember leg warmers, ponytails on the side, Farrah Fawcett wings and big hair, shoulder pads in everything, or broomstick skirts? Yeah, me either. 🙂 That must have been before my time 🙂 As I have matured, so has my style. I am a lot mor eclectic, and not as afraid of what others think. I have a really good sense of who I am, and frankly, I really am not overly attached to most of the furniture in my home. I know that it will change as I find things I like more or if the space we live in changes. 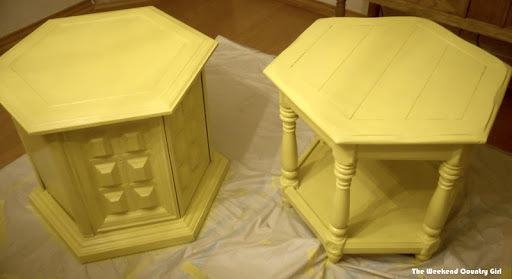 Today I am going to tell you a tale of three end tables. I like all three of them. I painted each with the same light neutral color; Behr Sea Salt, and in the right room, all three of these beauties would be a stand out. I am arranging them by decade… at least I think I am. I could be off with the 1960’s table. 1950’s Mid Century Modern. This baby was built when we were all about the space race. Sputnik, clean lines, homes of the future. Think George Jetson. Our national facination with space and exploration along with beating the Russians to the moon affected home design, clothing, house wares, and furniture. Do you have any buildings like those where you live? There were tons in the city I just moved from, but not so much out here in suburbia. Everything is new, and frankly a little plain vanilla boring. 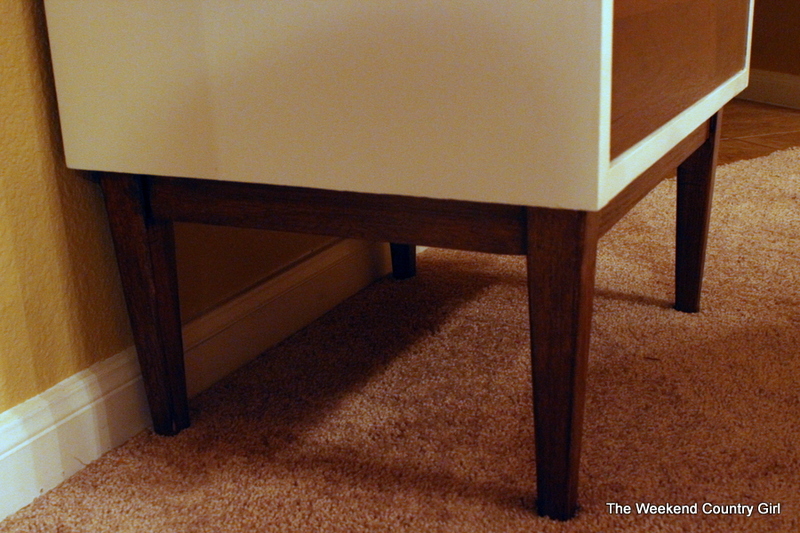 I painted the body of end table one sea salt, then stained the drawers and legs dark walnut. 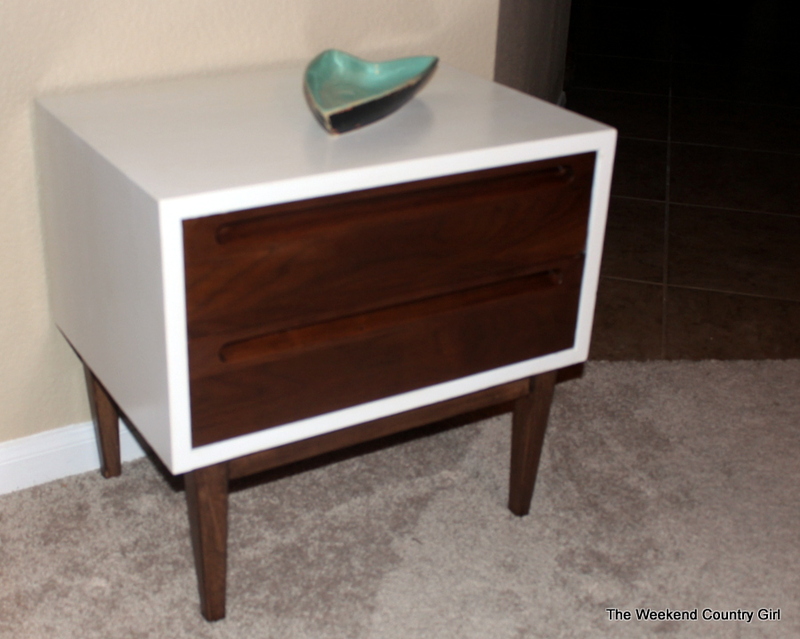 She is going back to her owner and will happily rejoin the headboard and dresser once they are painted but she would also be a stunner in a modern home with bright accents, a loft or a mid century modern home. I loved this look. I did decide that my interpretation needed dark legs to help it stand out a little more. 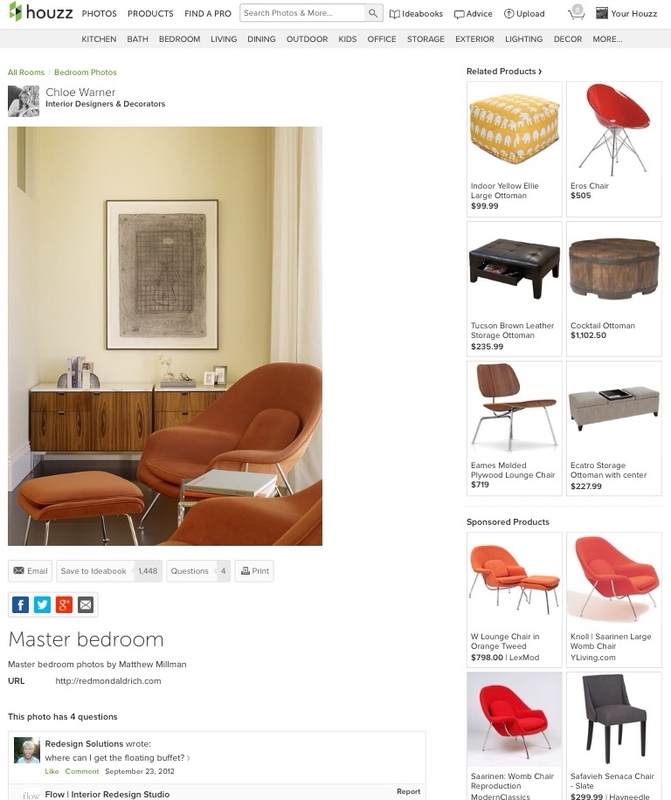 Mid century modern furniture mixes well with modern furnishings in today’s homes. I chose this shot because it has a credenza with a white painted top. Here he is all dressed up and ready to go. 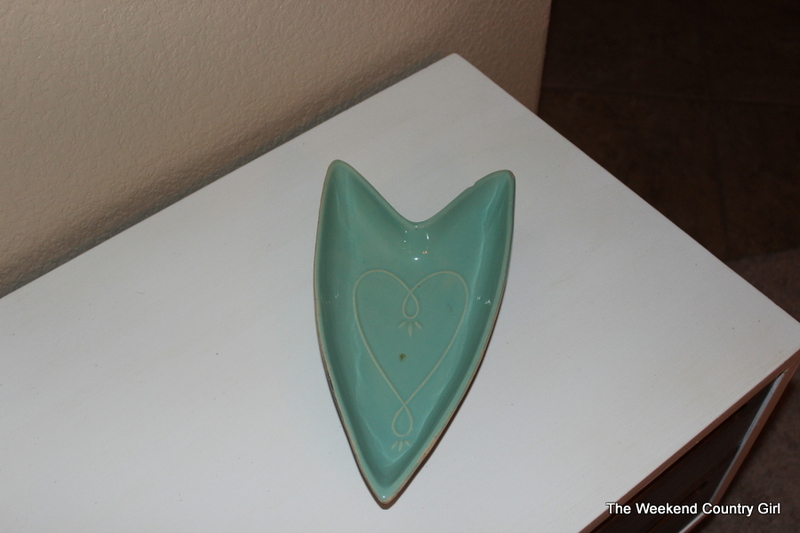 I like that I had a piece of 1950’s McCoy Pottery for the top. The late 60’s/ early 70’s. What can I say? Well… the one word I would use to describe most furniture in the late 60’s or early 70’s is safe. It was traditional in style. Varnished wood, rounded legs, , spindles, maple, pine and oak. Raise your hand if you had a couch that looked something like this in your home? I see those hands. 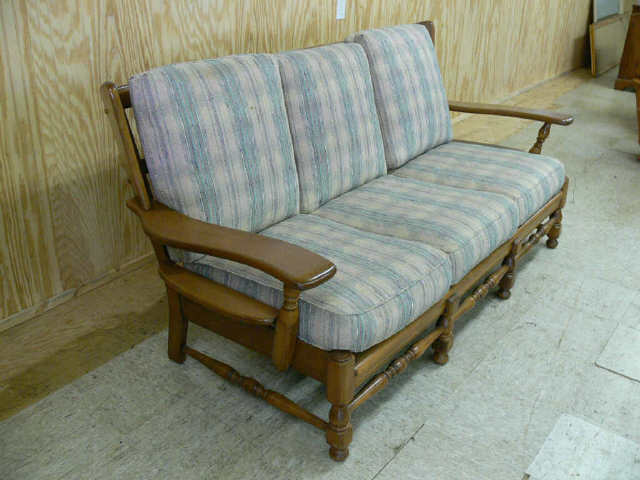 We had a couch like this with some scratchy plaid fabric for several years. This next side table would have been perfect in that room. It was brown on brown on brown. It also fooled me. The top was Formica, but was so dirty I thought it was wood. Who in their right mind thought Formica on top of furniture was a great idea? Not this girl. It was “the bomb” in the late 60’s/ early 70’s though. 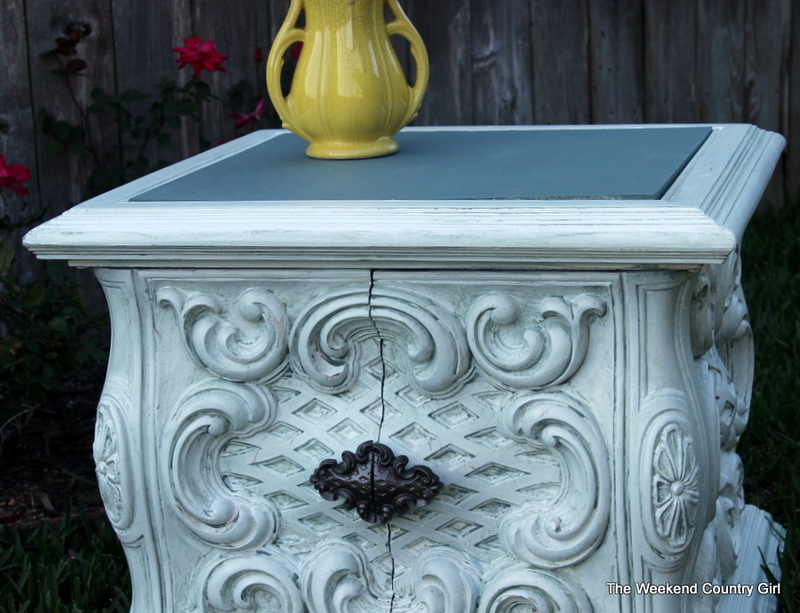 This side table came to me as part of a group of furniture I purchased using the “American Picker’s” bundling technique. Buy several pieces at reduced costs. I think I paid two dollars for it but I don’t remember exactly. After sanding the Formica top within an inch of its life to give it some grit, I then painting it with Glidden Gripper primer, then sanded the top again with really fine sand paper. 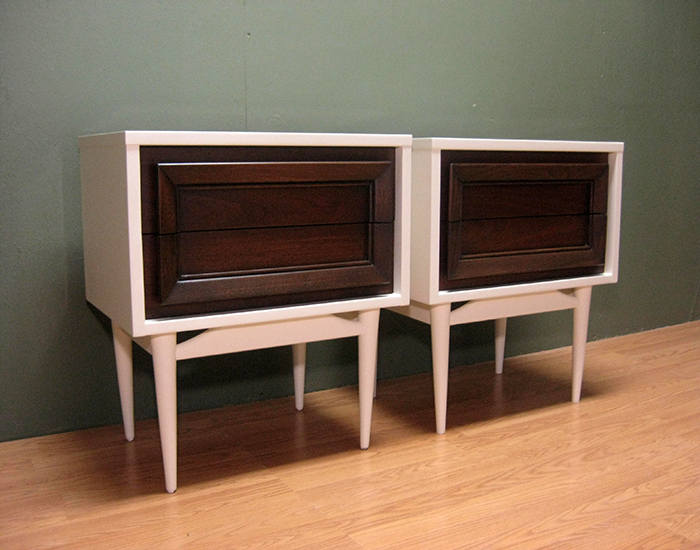 I decided to go with sea salt on the legs and Behr revival mahogany for the top to sort of replicate a stained top. 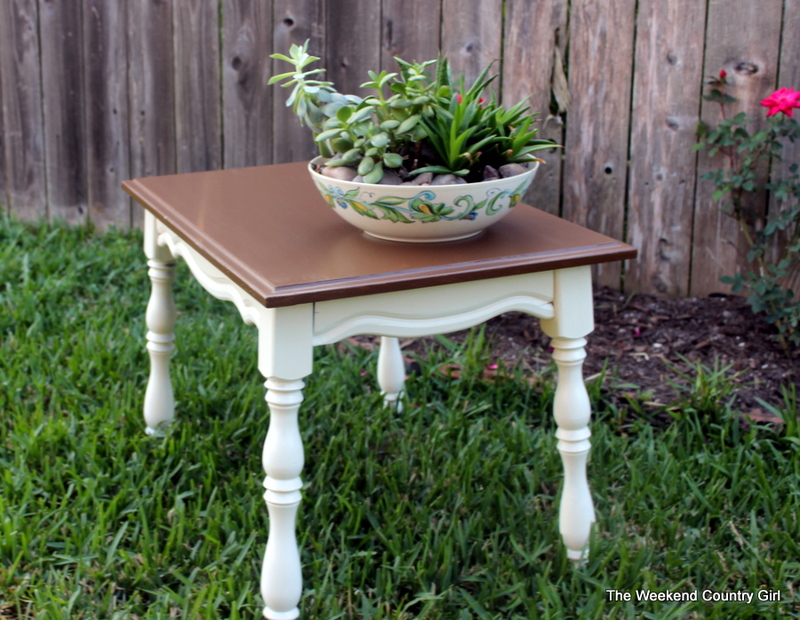 This little formerly frumpy table would be great in an apartment or small home because it does not visually take up much space. 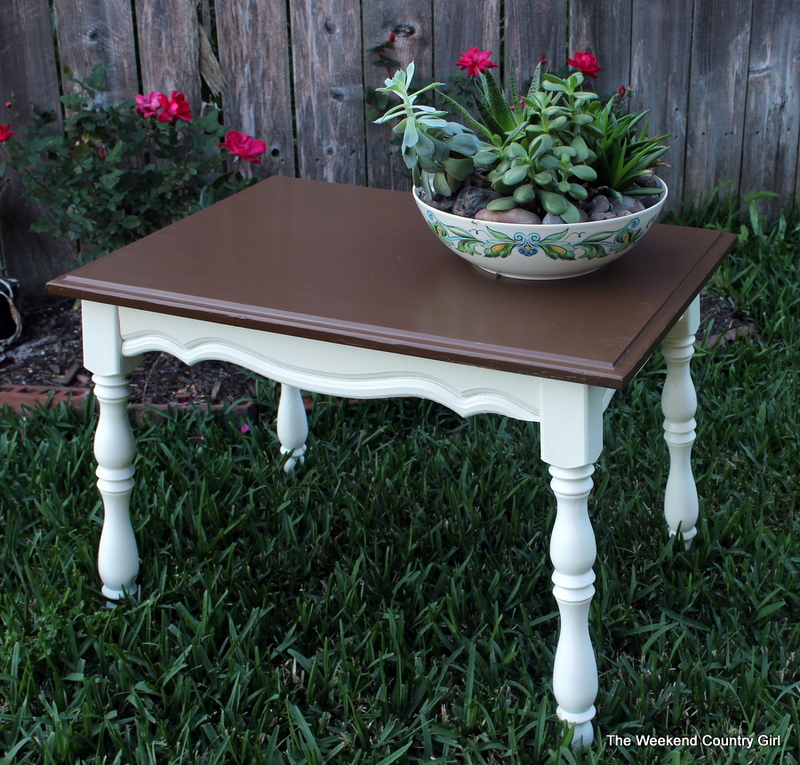 Here is Centsational Girl’s take on a two color table. I wish I could have stained the top of mine. 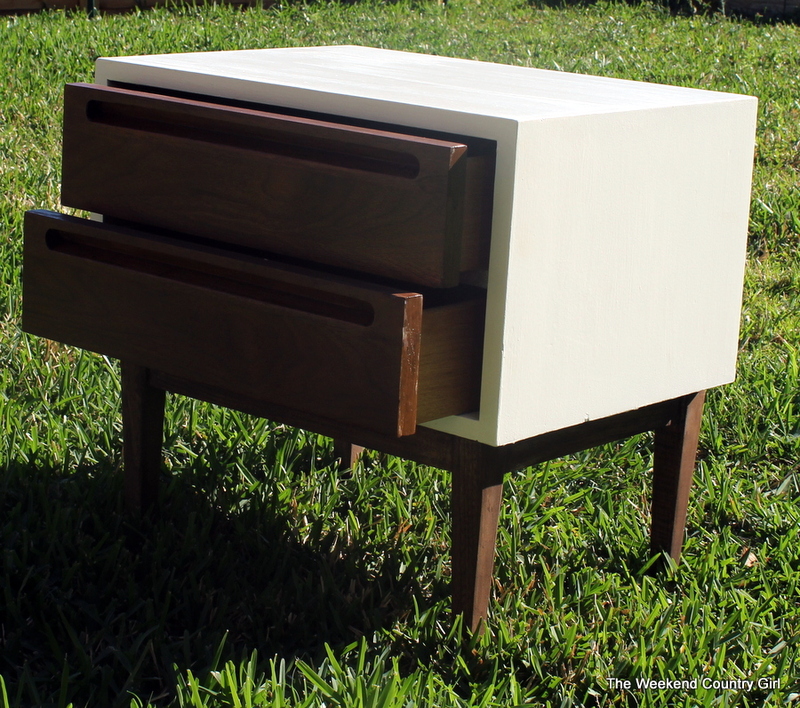 Finally, My 1970″s Fabulous side table. I mean come on. Who doesn’t love a table that is fun and funky? The mid to late 70’s furniture was fun. It was the era of disco, leisure suits, and over the top hairdos. I love this style. In small doses. 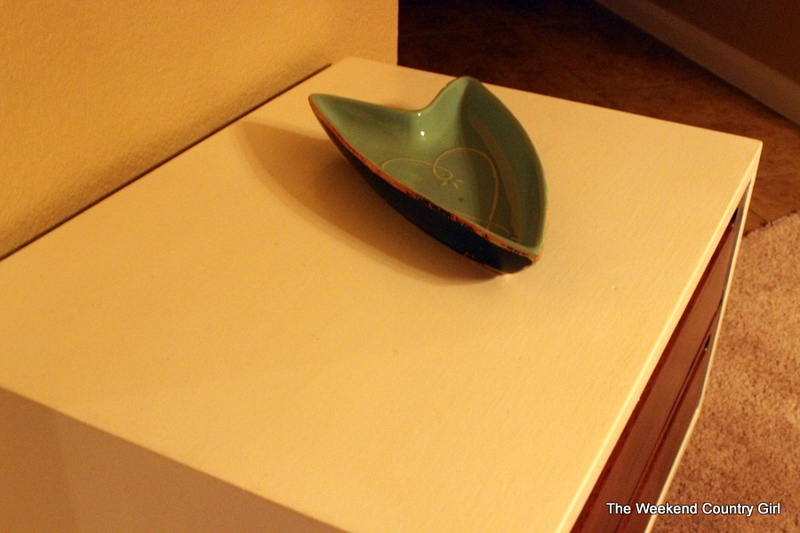 I could not have my whole home full of this curvy wonderfulness, but I do have a few pieces and I enjoy having them. They make me smile. 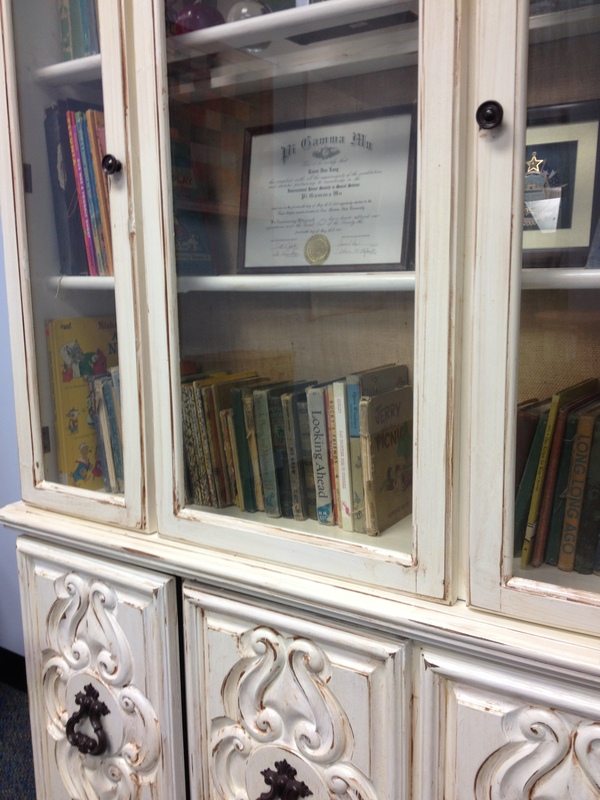 This curvy china cabinet is in my office full of vintage books. It looked like this when I bought it. 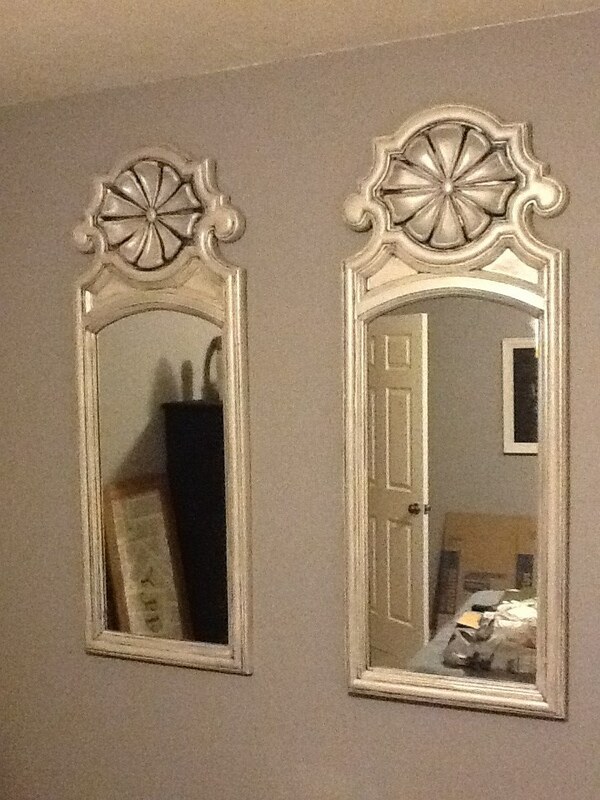 I bought this pair of mirrors and redid them. They are fun. The side table on the left was found by the side of the road. 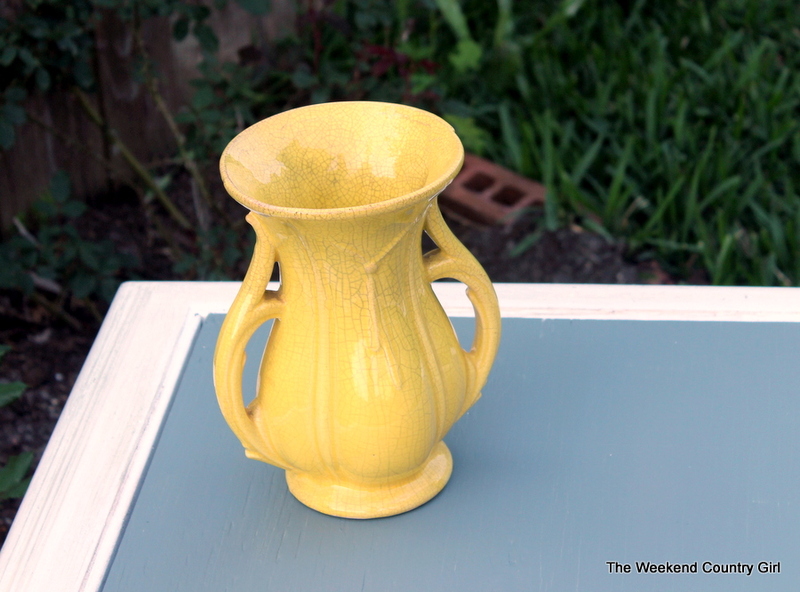 It is now in another home, but I enjoyed it in my yellow and gray guest room. This particular side table would be great in a teen’s room, college dorm room, or as a bedside table. 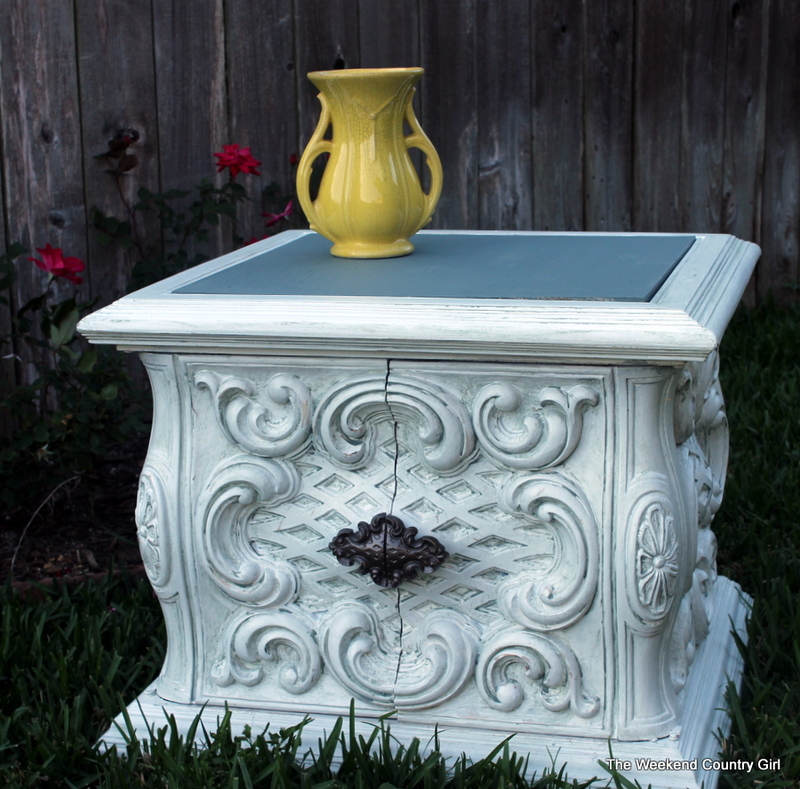 I painted it sea salt with a Behr Gray Area on the top. I like it a lot. 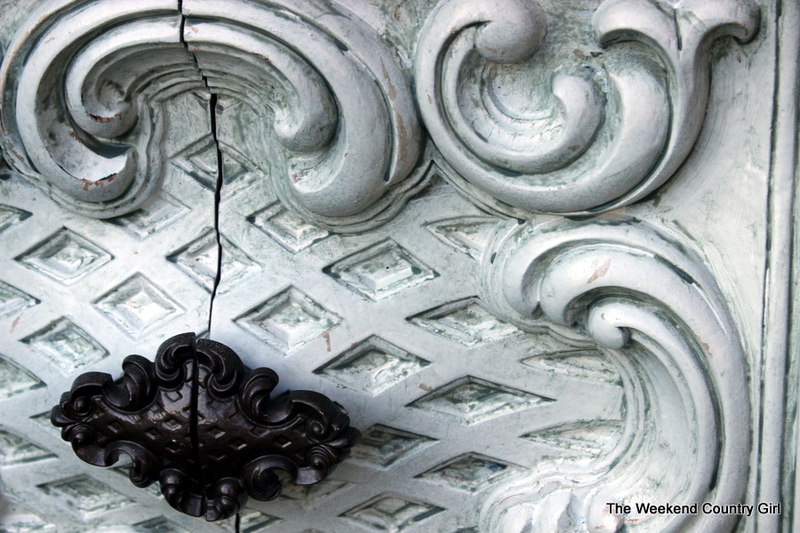 I glazed it with a gray glaze to make the detail stand out a little, but not too much. I debated painting it turquoise, navy, or yellow, but I like the light color too. I am not sure where this one will end up. 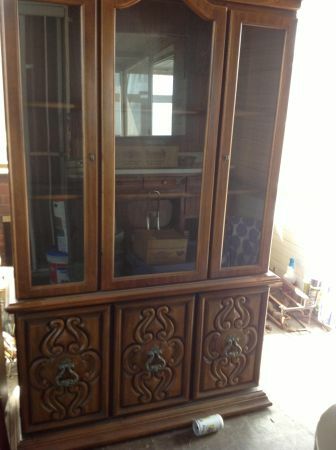 Who beside me, is ready to have some 1970’s love in their home?